The Epoch ECG Transmitter amplifies and transmits high-fidelity ECG data. Implants are small enough to be implanted into mice as young as P18. To record, simply place the animal’s cage on top of the receiver tray with the implanted animal inside of the cage. ECG data from the sensor is telemetered to the receiving tray and then sent to the data acquisition system. Used with an MP Research System and the power of AcqKnowledge software’s for automated ECG analysis routines to quickly score multiple channels of ECG data simultaneously. Complete system includes a receiver tray, two 2-channel implantable ECG sensor transmitters*, Faraday cage, and interface cables (2 x CBL102) to collect data from a mouse housed in an industry standard home cage. The receiver tray has BNC connections that easily connect to a BIOPAC MP150 data acquisition system (via the UIM100C) or third-party devices capable of accepting signals within the ±5 V range. *Mouse system sensors have a 2-month battery life, rat system sensors have a six-month battery life. The single-channel ECG wireless transmitter implant contains a small amplifier, transmitter, and a battery encapsulated in medical-grade epoxy. Each electrode is 7-strand braided stainless steel with Teflon insulation. Each strand is 50 μm in diameter, making the bare electrode 152 μm in diameter (229 μm diameter insulated). 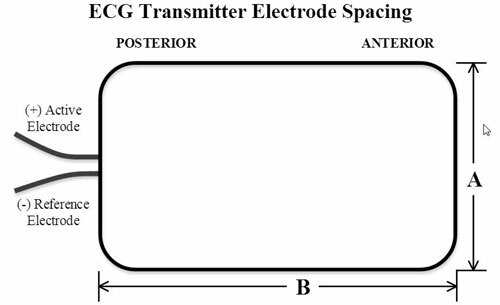 There are two electrode leads on the ECG transmitter; spacing for these leads on the transmitter is detailed below. The output gain of the transmitter is set at 2000x during production (±1 mV range). EPOCH Systems include two sensors; additional sensor transmitters can be ordered individually. Add the Sensor Activation & Test Utility (EPOCH-ACTI) to start the sensor battery when ready to use the transmitter. The reusable activator is battery operated and can be used for any sensors that are ordered as deactivated. Transmitters must be activated within 6 months of shipment to ensure the full 2-month or 6-month active battery-life. Sensors will be shipped with the battery running unless requested as “deactivated” when ordered. Request “deactivated sensors” in the comments section when ordering sensors or systems. Deactivated sensors require that the user has an EPOCH-ACTI on-hand or includes one in the EPOCH order. The activator utility can also output two independent channels of data (sinewaves) for testing purposes. For more options, add SleepSign (SSA100W) for complete sleep data analysis or use Camera Systems (CAMSYS4 or CAMSYS8) to monitor and record protocols and animal behavior. Recorded video will be time synchronized to the physiological signals in AcqKnowledge for easy investigation of key areas of interest.